Watch the MrMikes Fiero Re-Upholstery Instructions on YouTube. and will more often than not turn out wrong. DO NOT throw anything away, safer this way. 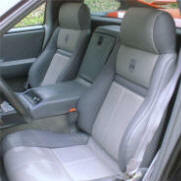 All pictures on MrMikes.com are of customer installed seat kits. They did it, so can you, it’s not hard. 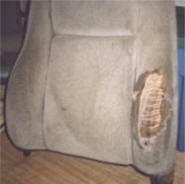 Video instructions show you how to remove the old upholstery and install the new. Upholstery tools and supplies are included. The new upholstery arrives complete and ready to install, there is no sewing involved. Beautiful! I installed your leather seats in my '87 Fiero GT over the Thanksgiving weekend and couldn't be happier. The quality of the leather and craftsmanship of the covers is superb. The instructions were great. Anyone could install these covers by following the video instructions. 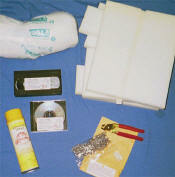 Also you give a complete kit including all the tools, padding, glue, etc., which was great. 1. 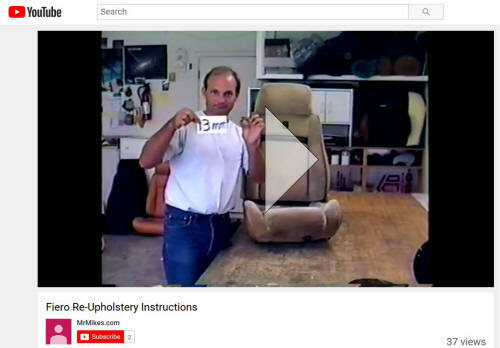 Video instructions that show you how to install MrMikes Leather Seats-Kit. Step by step and in real time you will see how to dismantle the seat, remove the old upholstery, and attach the new. 2. Installation Kit that includes Hog-ring pliers and Hog-rings, spray glue, razor blades, foam pads, cotton padding, instructions on the care of your new leather seats. 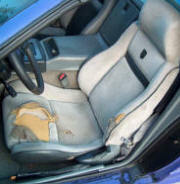 (the actual seat, after the old upholstery is removed). 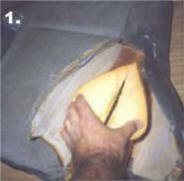 It is very important that any damage to the core be repaired (padded) to avoid premature wear of the new upholstery. Any metal bars and sharp edges must be padded. Pay particular attention to the drivers outboard bolster as shown here. Failure to repair core damage will void your MrMikes warranty. 1. Bolster damage is most common by the driver's door, often the damage is not visible. Years of wear will cause the inner bar to eat at the foam from inside. Slit foam with a razor blade (included) to expose the metal bar. 2. 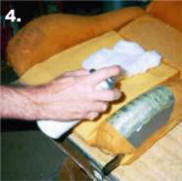 Pack cotton around the metal bar and fill any voids in the foam. Spray glue (included) into the cut, onto the cotton (included), and the foam. Pull foam up and around the bar to encase it. 3. 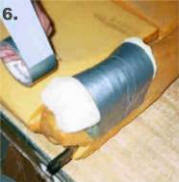 Cover the cut with duct tape. 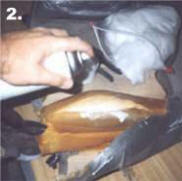 Spray glue the foam first, this will make the duct tape stick on well. The tape will hold the cut closed. 4. You're not done yet! Spray the repaired area with more glue. 5. 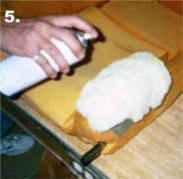 Place a piece of cotton onto the wet glue, the glue will help hold it in place. Spray glue over the cotton and down onto the foam. 6. 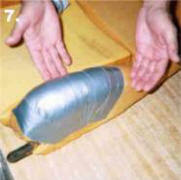 Cover this second layer of cotton with duct tape. 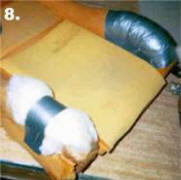 Compress the cotton with the duct tape as you go. 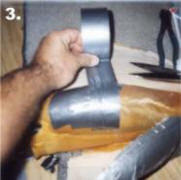 The second layer of tape should be longer and firmly stuck to the foam. 7.That's it! If you feel metal pad the areas until they look like picture #7.